First Line: "Exactly twelve minutes into cheerleading practice, and I already wish I were dead." I love reading about Witches so when I got my hands on Hexed I was pretty excited to start reading it unfortunately Hexed lacked a lot of things that makes me fall in love with a book. Right off the bat I couldn't stand Indie she was so shallow and snobby she just rubbed me the wrong way. I kept waiting for a redeeming quality about her that would make me like her or try to understand why she was the way she was but nope nothing. And when I thought I couldn't dislike her more we meet Paige and the way she treated her was downright horrible, Indie acted as if Paige should be grateful that she even spent time with her it's not till later that Indie realized how messed up she was to her but yet still continued to use Paige. Another thing about her that got on my last nerves was that she was whiny and it seemed like every few chapters she burst out crying. I didn't find myself connecting with anyone mainly because there was no depth to the characters. There was Paige who was always following Indie around and we know that she is a good person but that's it. There was Bianca Indie's crappy best friend who was mean and hated her and that's all we got from that. We meet Jezebel who is Bishop's ex and she gets labeled as a tramp by Indie. I think the only character we get even a little insight on was Bishop and that was when he let Indie in a little about what happened to his mom. There was also the bad guys the sorcerers but that was just it they were the bad guys they wanted to kill off the witches but we don't get much of an explanation I just feel everything and everyone's character could have been more thought out and more developed. A couple things that I did like was that Hexed did have some funny moments, and I liked that Krys didn't hold back on the gruesomeness. She had no issues killing people off. 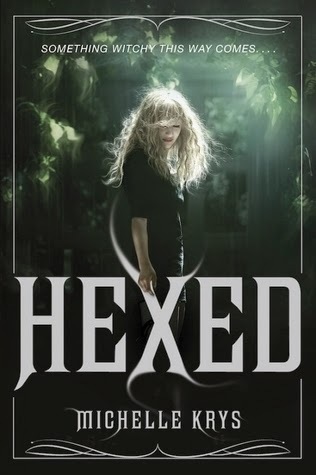 Overall Hexed was just an okay read and honestly it just wasn't for me but if you like to read books on witches I would say still check it out because there are a lot of people who did really enjoy this book I'm just not one of them.